RATLIFF AND BLACK MAGIC, K.S. Subliminal Sounds present a first time reissue of K.S. 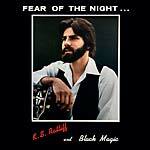 Ratliff And Black Magic's Fear Of The Night, originally released in 1982. A rare and unique teenage psych garage private press album. Here's the inside word from the pioneering record collector and front man of New York's Endless Boogie, Paul Major: "The first time I heard this record I had to vigorously punch myself in the face to make sure I wasn't dreaming it up. It's real. K.S. Ratliff comes on like a blast from a lost world, a maverick small town flash from high school kids in some alternate Kentucky utterly isolated from any scene and untainted by even the slightest stink of music biz disease. Real people. This music has the direct and real emotional honesty of Kenneth Higney crossed with the ominous sci-fi atmosphere of Marcus, boiled down to the essentials, merging a psyched-up garage sense of teen discovery with music so uncontrived it naturally delivers hook after hook. Brilliant songs like 'Brainstorms', 'Fear Of The Night', and 'Invasion' are right to the point. No pretense or distance seems to exist between the singer's mind and what is crashing into your ears. The vocals redefine the concept of talent and the no frills fuzz guitar/organ action has an uncanny mysterious quality like something hiding in plain sight. You can dig it straight up but if you turn your mind a little to the left or right you can climb right into another dimension. It's like your seemingly ordinary next door neighbor has been hiding a flying saucer in his basement and you just found out about it. Real people private pressing records come in many flavors but the best ones have some unifying elements. They sound like nothing else even if some of the moves they make convey a bent sense of the familiar. They emerged from a nurturing isolation and remained unknown until the right ears stumbled across a copy. The person and the music are inseparable, fortifying each other into a zone where ordinary musical standards become irrelevant as an indicator of quality. In 2018 the once constant flow of unique and important vintage discoveries has slowed to a trickle. K.S. Ratliff and Black Magic is an extra tasty killer that I file in the 'I can't believe a record like this actually exists' section." Edition of 500.